The post-2016 “new” Democrats who got involved in politics after Donald Trump was elected President keep surprising us with just how nuts they really are. And there is a fey, lack-of-recognition in their own craziness – like a guest who shows up at dinner with a bag of their own excrement… and thinks nothing wrong in doing so. Top 2020 Democrat candidates are taking the stage this week at the 2019 ‘We The People Summit’ in Washington, DC. As the event began on Monday, there were a series of opening remarks from participants and organizations, and Jamal Watkins of the NAACP led the crowd in a chant. The #Resistance continues to quote Shakur’s words, and did so today on the stage at the event where most of the declared 2020 Democrat candidates are speaking, including Senator Cory Booker of New Jersey (where the State Trooper was murdered), former HUD Secretary Julián Castro, Senator Amy Klobuchar (D-MN), former Texas Rep. Beto O’Rourke, Senator Bernie Sanders (D-VT), Senator Elizabeth Warren (D-MA), Governor Jay Inslee (D-WA), and Senator Kirsten Gillibrand (D-NY). Will any of them offer a similar disclaimer? On Saturday, Governor Phil Murphy was up in Sussex County to promote the candidacy of two Democrats who are running for the Assembly, Deana Lykins and Dan S. Smith. 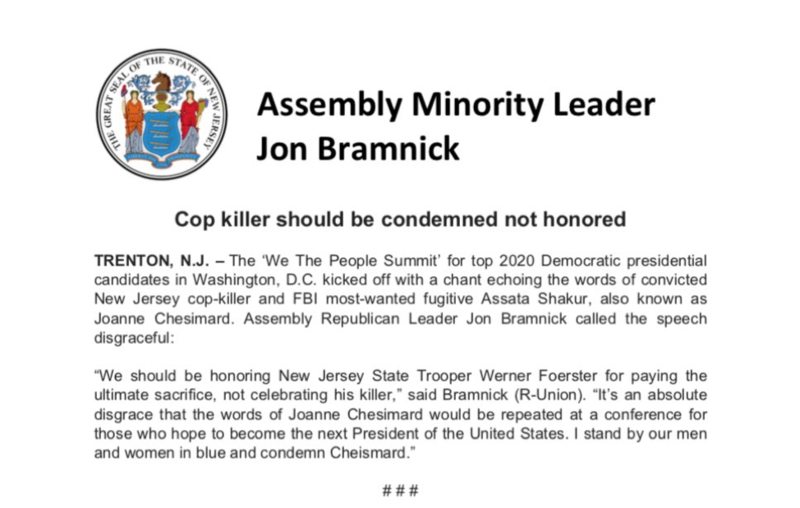 Lykins, is an insurance industry lobbyist, and Smith, the city attorney of Orange (Essex County), was also an officer in the NAACP – just like the “new” Democrat who led the Marxist cop-killer’s chant on Monday. We wonder if Mr. Smith has anything to say about this sorry incident?? ?